In stock -This product will ship today if ordered within the next 13 hours and 17 minutes. This delicious AHA fruit mask blended with 100% natural fruit acids including Glycolic Acid from Sugar Cane delivers instantly smoother plumper skin. 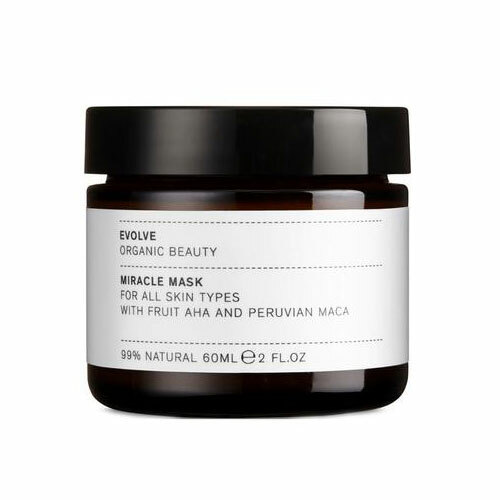 Peruvian Maca, an ancient energy booster, helps to increase cellular renewal and skin radiance and reduces the appearance of ageing whilst Papaya acts as a natural exfoliator. Aqua (Water),Citrus Aurantium Amara (Bitter Orange) Flower Water*, Glycerin*, Xanthan Gum, Galactoarabinan, Sclerotium Gum, Aloe barbadensis Leaf Juice Powder*, Hydrolyzed Lepidium Meyenii Root*, Vaccinium Myrtillus Fruit Extract, Saccharum Officinarum (Sugar Cane) Extract, Citrus Aurantium Dulcis (Orange) Fruit Extract, Citrus Limon (Lemon) Fruit Extract, Acer Saccharum (Sugar Maple) Extract, Hippophae Rhamnoides Fruit Oil*, Carica Papaya (Papaya) Fruit Extract*, Parfum (Natural fragrance), Lecithin, Pullulan, Silica, Maltodextrin*, Tocopherol, Lactic Acid, Sodium Levulinate, Sodium Anisate, Sodium Dehydroacetate. Apply an thin layer to dry skin, leave for 5 minutes and then rinse off. A tingling sensation is normal. If you experience any sensitivity to the active ingredients such as burning or itching remove immediately with tepid water. Patch test first if sensitive and avoid eye area. Below are reviews of Evolve Miracle Mask - 60ml by bodykind customers. If you have tried this product we'd love to hear what you think so please leave a review.